eloped by climax for XBOX 360 and PC's.It is the second edition of motogp game . This game include new tracks and more drivers apart from motogp. Players can take part in race with three choose able circuits (jerez,Phakisa,Suzuka).Others circuits are locked .Some of the riders in the list are also locked and can be unlocked by playing the game. 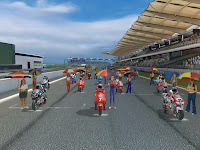 Like wise motogp 1 motogp2 also include three levels and one unlock-able level..Featured part in the game is stunt mode where the player race a one lap performing different stunts as wheelies, burnouts and power slides for points with these points you can unlock different circuits and players.In stunt mode the player will lose the points obtained if he/she overrides outside the track. Free full version games , Download free Spider man 3 Game ,Download download dlf ipl 4 game, Download free Full version Games.